Board games can be categorized into two camps: those that stand the test of time, and those that serve as windows into a moment of time in popular culture. Classic games like Monopoly, Scrabble, Clue, and Operation have been regularly “refreshed” by their owners to maintain their appeal across generations. They tell us something about the human psyche because they represent themes and interests that transcend time: acquisition, power, intrigue, and pride in very specific skills like language and dexterity. Other board games tell us something about ourselves because they are rooted in a specific moment in time. They reveal the attitudes and trends that existed momentarily, at the time they were produced. Barbie Queen of the Prom is a great example. Released in 1960 by Mattel, this game relies on a series of clichés and politically incorrect attitudes towards girls that today seem cringe-worthy, but which permeated and defined culture 50 years ago. On its surface, Barbie Queen of the Prom is a traditional item collection game. 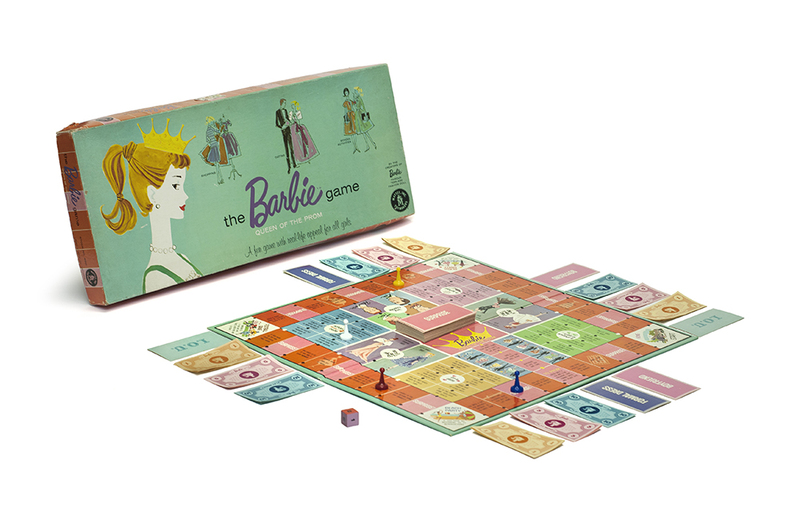 Players take on the role of Barbie and travel around the board through the roll of a die trying to complete a variety of tasks, including earning enough money to buy a formal prom dress, finding a steady boyfriend and getting a ring from him, and confirming their popularity by being elected President of a school club. The first player to achieve these milestones and be crowned Prom Queen is declared the winner. Mattel integrated some standard board game mechanics into the game. For example, passing home pays players an allowance and “Surprise!” cards are thrown into the mix to assist or slow down progress. The game’s “Special Areas” allow players to venture off the main board to acquire more money (“a chance to earn”), learn (“in school”), participate in extracurricular activities (“school clubs”), and mingle with boys (“on a date”). As I mentioned above, game play is firmly rooted in the 1960s. The jobs available to snag some extra cash include typing letters, washing dishes, and babysitting. Dating in Barbie Queen of the Prom is also a pre-Tinder minefield, filled with required trips to the beauty shop, patiently waiting while a conversation takes place with your Dad about cars, and being scolded (by losing a turn) for not being ready when HE calls. The original version of Barbie Queen of the Prom had a place on store shelves for over ten years, before disappearing in the mid-1970s. Mattel rebooted the game in 1991 with the release of Barbie Queen of the Prom – 1990’s Edition. A replica of the original game was also re-released by Mattel in 1994 to coincide with the game’s 35th anniversary. Recently at the 2015 New York Toy Fair, Mattel announced that it's teaming up with Google to reboot the View-Master, the iconic 3D stereoscopic picture viewer that has fostered exploration, entertainment and discovery for 75+ years. It’s International LEGO Day and we're celebrating the birthday of the classic LEGO brick with Graham Hancock, LEGO collector and deputy editor of Blocks magazine.